Hopefully, I can finally watch and review it with eyes unclouded. It’s been more than 10 years since the last time I watched Princess Mononoke back in my school days. This was one of the first Ghibli films I was exposed to. I remember that I did not love this anime all that much. I didn’t really get it and was puzzled by the critical acclaims the movie gathered. Was it the decapitation by arrow scene or the music? It must be the music. Yeah, I was kind of thick-headed back then. So ten years had passed and my anime experience became much stronger. I decided to watch Princess Mononoke again. It turned out that I did not love it more than I used to but I admired the anime immensely more than I did in those days. Here’s the review from the guy who can finally watch Princess Mononoke with eyes unclouded (at least that’s what I was trying to do). Since there’re already countless of brilliantly written reviews of this anime from both anime and movie critics, there’s no use for me to repeat about the same old topics like plot summary, feminism or the timeless music of Joe Hisaishi again. Instead, I’ll raise five points that I deem significant and unique. They are something that only few (if any) other anime could capture, even after a decade had passed. Of course, trees and forest and eco system are essential for keeping our blue planet alive. We all know how important nature is and we should all help preserve and restore it. But most of the stories in all media almost always tell stories from one side; the green side. It’s all about evil men trying to destroy nature for some greedy reason. 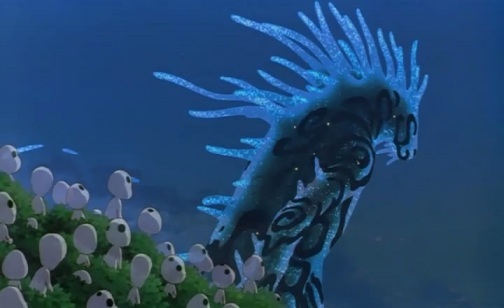 In Princess Mononoke, half of the movie focused on the human faction who was cutting down the forest and hunting for gods. They were not evil. They were just like the rest of us who lived under our own complex conditions that drove us to do what we did. Princess Mononoke told the story from both sides in a non-judgmental way. I sympathized with human in this movie. It’s not enough to only care about the green. There’re endless details to consider and that’s very hard. After watching this anime, it occurred to me that human were having trouble getting along with everything else, even among ourselves. In the anime, Lady Eboshi’s ironwork fortress was full of outcasts; women seeking freedom from oppressive society, lepers who were shun by people, the fortress itself was built to withstand the invasion from the greedy government. The presence of human fortress disrupted the long standing harmony of the forest along with the gods and animals. Everywhere human went, they fight with the ones who were there before and they fought with each other. What’s more, human also suffered from internal struggle and conflict as shown by San’s character. She was human but was raised by wolves. When she met Ashitaka, she found herself in difficult situation; she was human but she also hated them as much as she loved them. This was like an analogy of the world nowadays. We are arguably the most powerful faction on the planet. With fire and steel, we conquer all, even the old gods of the forest, the sea and the sky. But we forget that we cannot survive just on our own. We are actually part of something bigger than ourselves and once we destroy everything else, we find ourselves in trouble. Yes, I am referring to the global warming, among many things. 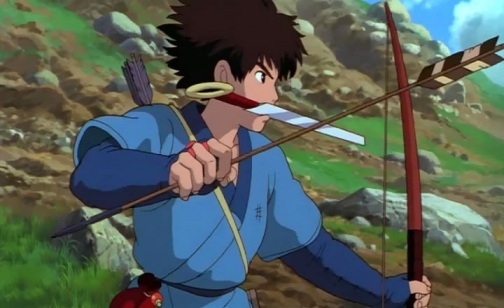 In Princess Mononoke, Eboshi and her host did not have much difficulty in killing the Deer God. But the aftermath of that event left lots of men dead, the survivors homeless and the land completely drained of life. Luckily, Ashitaka and San managed to return the severed head back to the angry god and restored life. In reality, we do not have the same kind of opportunity like that. 4. The governments are not to be trust, never! This one was probably a no-brainer. Anyone in the position of power is never to be trusted. There’s always hidden agenda to look for. 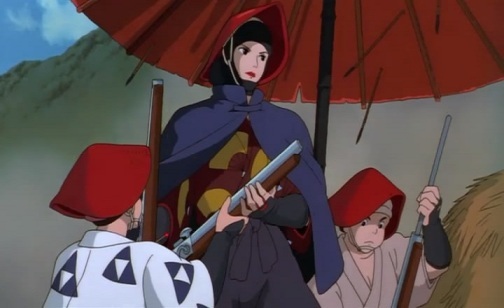 In the anime, Lady Eboshi was used by the government who gave her the intelligence on the location of the Deer God. Once she left the ironworks’ fortress, the government sent his samurai to lay siege to Eboshi’s fortress in an attempt to take over the ironworks and the ability to produce powerful firearms. Why was I not surprised? A masterpiece tells the story from the eyes unclouded. 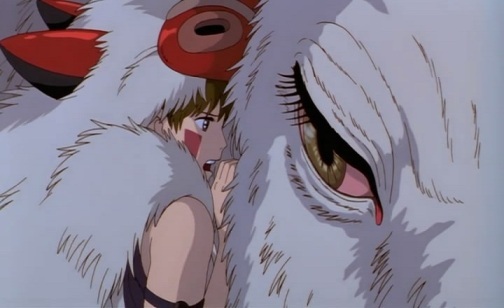 Princess Mononoke was that kind of anime which displayed the views from all sides. It showed the bitterness, the tenderness and weakness of human lives and how our fate intertwined with the world. Though the anime utilized surreal objects like the Boar God or the Kodama, its concept was very real; an epic fantasy at its best. For most of you, my friends, I urge you to watch this anime again if you are free. And for some of you who have not watched Princess Mononoke, you must watch it now. I cannot guarantee that you’ll love it but at least you’ll have some idea on how far an anime can go, what one anime can achieve. This entry was posted in Articles, Series, Talks and tagged anime, anime blogger, Environmentalism, Mononoke Hime, Princess Mononoke, Studio Ghibli. Bookmark the permalink. “Watching anime at the right time is as important as watching the right anime”. This is so true. Couldn’t agree more. Great points! I especially liked #2. Isn’t it funny how we often see depth that we didn’t know was there upon a second watching? “Princess Mononoke” is one of my favorite films and one of the gateway anime that got me into the medium – unlike you, I’ve watched it many, many times. Even so, when I last viewed it, a couple of months ago, I was surprised to see something I’d never seen before – Ashitaka’s personal journey and the changes in his attitude and character in relation to a broader understanding of the world he gets during the adventure; before then, I’d seen him more as a connecting point between various characters and themes. Though I did not write them down, there were several things about Ashitaka that I noticed during the re-watch just like you did. He served as the neutral character or buffer between clashing factions. His struggle to reconcile with everyone was admirable and, at times, futile. There are lots of anime (the right one) that I want to rewatch but like you said, watching it at the right time is as important. Unfortunately, there is hardly any right time for me these days. I’d label Princess Mononoke as one of the high points of Miyazaki’s films. Never enjoyed Spirited Away or Howl’s Moving Castle quite as much as this one since it touched on adult themes like environmentalism, doing in a way that shows many sides of the issue. Probably my most-watched movie ever. I seem to use it as a vehicle to introduce other people to anime. 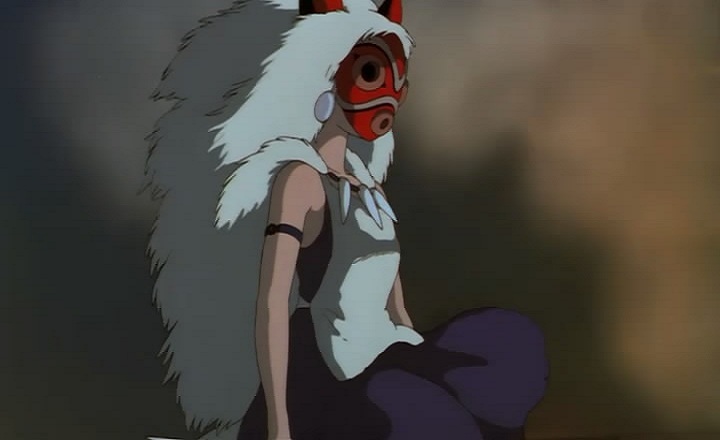 To me, Princess Mononoke felt like Miyazaki’s mature self at its prime. While Spirited Away or Ponyo, which were very good, represented his boyish self. I think I may have to take you up on the advice. It’s been quite a while since I’ve seen this series and I admit, I was pretty bewildered the first time. Might be time to give this one another look with a fresh perspective. I am sure you will find several new things from it this time around. What you said in your #1 point is the main reason I think the movie is so great. There’s no real villain and even the antagonists like Lady Eboshi are shown to have a good side and are not just about “taking over the world” for the sake of “taking over the world.” Many of the human characters are shown to be decent people and many of the animals are portrayed as rather vicious, so even though the film does lead a bit more toward the “green” side in my eyes, it’s totally not one-sided. It’s as if I knew that I wasn’t ready to review Princess Mononoke, ten years ago. I had nothing much to write and was not inspired to do so. Back then, I watched this movie because it was so highly praised. But now I watch it because I love watching anime. That’s why I can finally review it. It shouldn’t be hard to find this anime nowadays. I agree with #5 so much! Even now, there are a bunch of anime movies I know I need to rewatch! There were quite a few films I saw when I was younger that I disliked, but I’m sure part of it was because I couldn’t understand the story properly. Princess Mononoke is a film I’ve seen countless times. With almost every Miyazaki film, each time I rewatch one I seem to see it an entirely new way. Even his films that are less mature, simply because I saw them when I was I kid, so seeing them when I’m older makes for a very different experience. Lol, totally agreed with your last points of watching the anime at the right time. I watched Evangelion back then, and honestly, I had no idea wtf happened. And it’s only a few years after that when I finally appreciate it much more. I also watched Princess Mononoke when I was pretty young and I love it, the tears, the struggles and the drama, all the intensity is awesome. Though my memory’s quite fuzzy at the present moment, actually, my memory’s fuzzy for all the Ghibli films I had watched, lol. I may need to rewatch some one of these days. Evangelion is also another prime example of this situation. I was puzzled by all the praised it got when I first watched it. Then I did some additional reading on the religious reference in the series (people actually wrote pages after pages of review for this show!) and I could see the show in different light the second time I watched it. I think being a teenage is not a disadvantage. There are always anime that are right for each time of one’s life, I believe. I watched Whisper of the Heart in my teens and the anime never left me ever since. I suspect that had I watched it at different time, things would have been different. Like several people above this comment, I liked #5 as well! Background knowledge and timeliness are quite important factors in watching anime as well. There are lots of anime I’ve watched in the past which I wasn’t ready for. I watched Haibane Renmei back then and when I checked my MAL, I rated it 7 and asked myself why it got a score that low (7 is low for me). After rewatching it, I just had to reinstate it as a 9. I still don’t understand why the younger me scored it that series a 7. Ghibli’s movies have never been my cup of tea ever since but I liked this one because it wasn’t that high-fantasy in terms of genre and it covers pretty much relate-able situations to us humans, like the green movement you’ve mentioned. I like that the two protagonists of this movie are somehow sandwiched between the choosing between world of the Gods, and that of humans. It’s quite real, and at the same time sad that often times, the option “diplomatic” talk just doesn’t seem to exist. LOL, Haibane Renmei is probably one of those wonderful anime that I knew immediately how good it was but didn’t know why in the first try. In the end, it was not about understanding it but rather about how the anime left so much to the viewers interpretation. nice review to a old anime series,sometimes the old show can be like by the new viewers.but for i don’t like it. well that’s my opinion i don’t know the others. I always believe that liking anime and admiring it are a different matter. In that case, I kind of understand why you didn’t like it. I even admitted in the post that I didn’t especially fond of the show but I admired it a lot. It was interesting to see how you managed to find such deep and rich levels meaning in the movie despite not liking it. It takes a lot of experience and maturity to acknowledge the greatness in things even if you don’t like them. I tip my hat off to you. I REALLY need to re-watch this movie, I think I watched this movie too young and need to re-experience it. At the time of watching this my expectations of anime was simply to provide me with magical girl warriors. If I remember right I felt a bit lost during this movie. Since maturing as an anime fan I’ve watched and enjoyed a few more Ghibli movies (Spirited Away and My Neighbor Totoro being my favorites). So I’m hoping if I watch this again at some point I’ll be able to appreciate it, my memories of this movie are EXTREMELY vague so I’m hoping it will be like the first time. Wow what an insightful and deep review, Canne. I watched Princess Monoke just last night, so I’m a late blooming fan ^^. Anyway, I have watched a few other Studio Ghibli movies such as, Howl’s Moving Castle and Spirited Away etc., and they were breathtaking. So I went into this movie having REALLY high expectation, especially after hearing so many great things about it. But the movie didn’t live up to what I was anticipating. I do like the movie, but it wasn’t the best Studio Ghibli work out there, IMO. The characters wasn’t that likable and there was no clear ending. But I did find the movie to be very creative, meaningful, and worth seeing. I think I like the movie a bit more after reading your review :D.
And welcome to the fantastic world of Ghibli films or more precisely, the magical world of anime! The first time I saw Princess Mononoke, I think I was 7 or 8. The movie completely terrified me, and left me shocked, disgusted, and confused. I had also seen Spirited Away at around the same time, and had a similar reaction to it. Some years later, when I was 14, I decided to watch Spirited Away for the second time, to see why I had hated it so much and if it was really all that bad. I was dead wrong. The movie completely blew me away; it was so beautiful, fantastical, and I could relate to the characters on a personal level. I sobbed at the end of the movie. It’s hard to put into words what I felt, and how those ending scenes affected me. I still always end up crying at the end of Spirited Away whenever I watch it to this day, despite the countless times I’ve seen the movie and know what’s going to happen. It’s the only film that draws such a strong emotional reaction from me. I watched Princess Mononoke for the second time today, thinking I had misjudged it, just like I did with Spirited Away when I was a kid, and let my fear distract from the plot. And after watching it…I have mixed feelings about the film. I think, my emotions got in the way of me properly understanding what was going on. Too many things were happening at once, and I think I got swept up in my reactions. And I also think, maybe I am possibly not yet mature enough for this movie, since I just don’t get it. It touches on very deep subjects, I can tell, of which maybe I am not yet maturely equipped for to comprehend. I can sense the beauty, yet am also at the same time horrified of the film. It is ugly and beautiful, horrible and alluring. I will watch it again and again in the years to come, and see if my comprehension of the film becomes any clearer and meaningful, as I get older and have more life experiences. I really hope to see what everyone else is seeing of the film, and deeply understand what it’s telling. I hope one day I can see this film with “unclouded eyes,” like Ashitaka was trying to view the struggle between the humans and Nature.